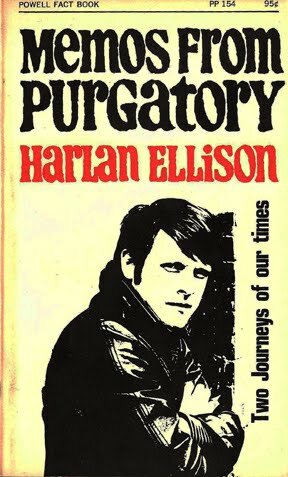 MaggieThompson.com: More Anecdotes about Harlan Ellison. Just Saying. He's made a joke of it. The door to his study is a work of art, a sculpture in itself. And one of its aspects is that the lintel is something like four feet above the floor. Which means that everyone including Harlan has to stoop to enter his work area. Hee! Oh, didn't I also promise to tell you about his early experience as a television interview subject? OK, this was fun. He'd have handled it with aplomb later in his career, but these were relatively early days. (The version of the book he was promoting shown here is a later edition; the first release was a Regency paperback in 1961.) Background: Dorothy Fuldheim was a major TV personality. She has a lengthy entry on Wikipedia, which notes that she may have been the first woman in America to be anchor of a TV news broadcast. In any case, in 1961 she had an ongoing feature on Cleveland TV in which she interviewed guests, and it was a coup to be the subject of such an interview. She had an incredible style that merged occasionally insightful questions with being out of touch on a strange variety of topics. (I think I recall her answer to rats in the slums as being that slum homes should all have garbage disposals in their sinks. I know I recall her asking Gaylord Perry about Me and the Spitter precisely what it was that a pitcher did in baseball. "I mean is it like a tennis player serving the ball?" was roughly her elaboration - as people in the studio tried unsuccessfully to stifle their laughter.) Anyway, there was Harlan, trying to promote his book of essays - about running with a teen gang to get information for his writing career and about incarceration in the Manhattan "Tombs." Gang violence and jail: Memos from Purgatory was and is strong stuff. So here he was in the studio, facing Dorothy Fuldheim, and he began by saying that, as he'd embarked on a writing career, he'd worked a number of jobs and then decided that the topic of his first novel would be kid gangs. Fuldheim asked what jobs he'd worked. Thrown a bit off-stride, he listed a few, including driving an ice-cream truck. "Oh, did you always want to do that?" "What?" "Drive an ice-cream truck. You know, when I was a child, I always thought that driving an ice-cream truck would be such a wonderful job ..." I've seldom seen Harlan more taken aback. As I say, today, he'd easily regain control of the message to make his points. But that was a classic in the field of derailed interviews, as she continued to discuss how much fun it would be to drive an ice-cream truck and what career goals children have and so on ... And I was lucky enough to be watching the broadcast - a broadcast that never did give him time to share his messages on either kid gangs or jail. There: an anecdote not likely to come up at this week's MadCon 2010. It doesn't look as if Harlan will be well enough to attend in person, but I bet other anedotes will be flying. I hope I'll see you there! This is the second time I have heard about Dorothy Fuldheim.